Car hire at the airport and a 45 minute drive. The hotel has ample free parking. Car hire is not essential. Taxis from the airport approx €40 or the hotel can arrange transfers. Standing on the terrace at Belmond La Residencia, you feel like you’re on the top of the world, overlooking the delightful village of Deià and a landscape of orange and olive groves on steep mountain-sides. La Residencia has been created from twin manor houses which stood on the same spot some 500 years ago. Now these have been immaculately restored into one of the world´s most indulgent hotel retreats. Weave your way around the grounds between citrus and olive trees, though the immaculate gardens with the aroma of jasmine and orange blossom intoxicating, interspersed with a series of lookouts and then settle yourself in for the day at one of the two swimming pools with their panoramic views. 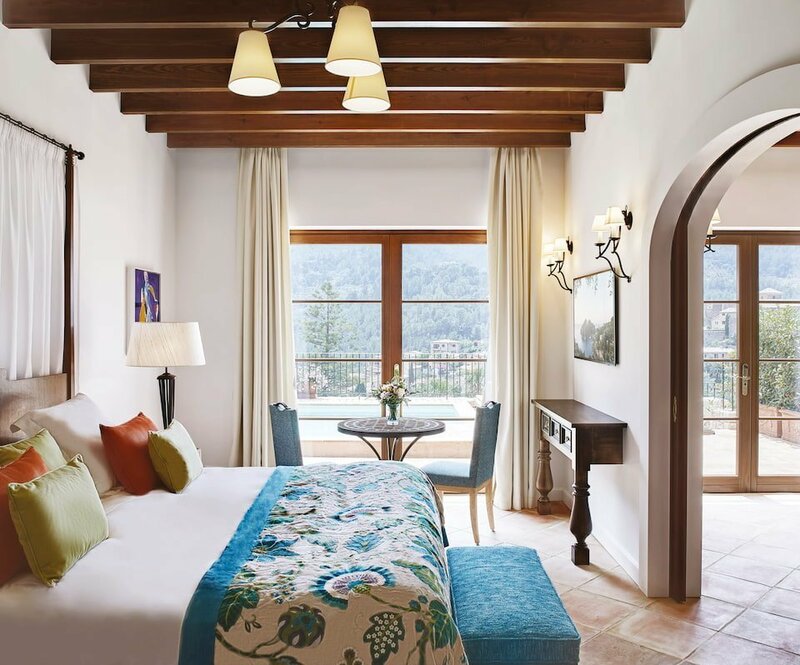 Each of the 67 bedrooms and suites are light and bright and have been sumptuously furnished in typical Mallorcan style, some with four poster beds, terracotta floors and ornate rugs. 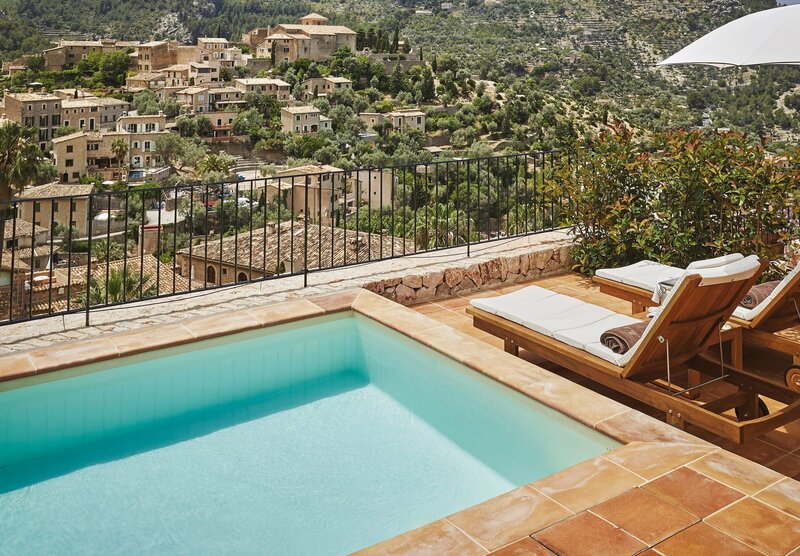 Each offers stunning views of the village of Deiá and tramuntana mountains beyond. As a low season traveler why not splash out, literally on one of the Exclusive suites where you can step out onto your own private terrace and take a dip in to your private plunge pool. Everyone is welcome at Belmond La Residencia. 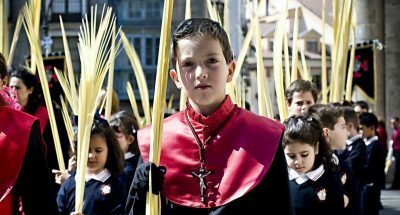 The children´s club is superb and each child will receive a special ´high five´when they arrive in the school holidays. Offering arts, crafts and cooking they are treated to fun-filled days in the kids club. The hotel is perfectly situated for a stroll on foot to the village of Deiá and make time for a visit to the fascinating house of the poet Robert Graves. You are a short ride away to the valley of Sóller and Palma beyond. Belmond La Residencia is about luxurious comforts, a welcoming environment, spectacular scenery and outstanding personal service, just take a look at their reviews on TripAdvisor. The hotel exudes style and sophistication but with a genuine relaxed comfort. A home from home (wishing mine was anything like this). Many clients return year after year, which is a testament to the loyal staff who have offered 5 Star hospitality over many years. The location is unique, coastal, yet in the heart of the Tramuntana mountains. The pocket sized Cala de Deià is an easy ride down if you are keen for swim in the sea, and the hotel will even pack you a picnic! The village has become popular as a celebrity hangout, but thankfully avoided the paparazzi madness. There´s a chance you may bump into the likes of Richard Branson, Bob Geldof, Kate Moss, or even Michael Douglas. If you don´t fancy venturing out, then you could retreat to the award-winning spa for a swim, steam or pampering in one of the treatment rooms. If you can’t stay at the hotel this time why not take advantage of the Pamper Day with Lunch exclusive to MallorcanTonic. Breakfast which is served between 07.30am -11.00am is a buffet breakfast or á la carte menu enjoyed either inside or outside on the terrace (weather dependant). 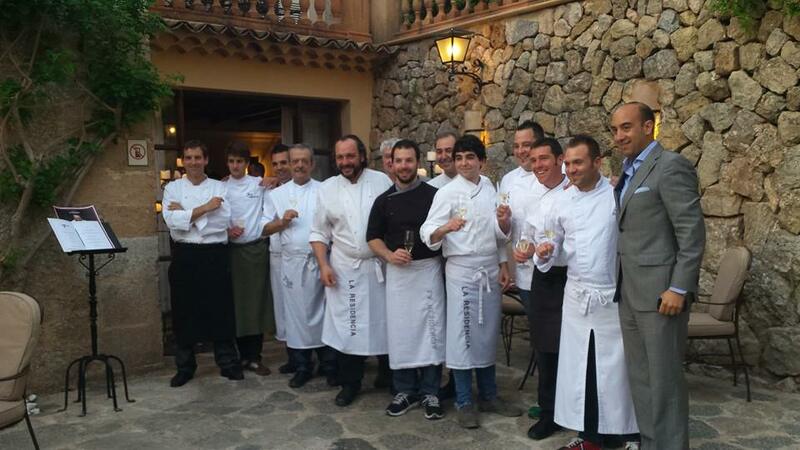 Chef Guillermo Méndez and his team create a memorable Mallorcan fine dining experience in El Olivio. For a more relaxed bite, try Café Miró, with 33 original Miró paintings on it´s walls (on loan) which offers lunch, afternoon tea and dinner as well as a selection of Mediterranean tapas. Food events are taken very seriously at La Residencia, so make sure you check the events page to see what not to miss! Images kindly provided by Belmond .